Don’t get deceived by it’s title,’F? 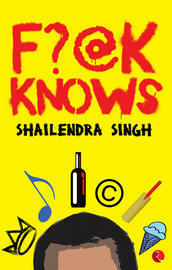 @k knows’ by first time author Shailendra Singh, is not your typical ‘boy meets girl-in I.I.T’ stuff.This book is a self-help manual for better living.If you are a regular reader of this blog,you might have figured out by now that I am not a great fan of these ‘Self-Help’ guides.I find them boring, unrealistic,highly impractical and simply not worth my time and money! But,after reading this humorous new book by Shailendra singh, I think my aversion towards this genre has got reduced considerably. *why he thinks,’greed is good’! F? @K Knows might not be a literary marvel or something,but still i believe it's a book which is worth reading.One sad thing which is quite common with books of this genre is the excessive usage of metaphors which only serves the purpose of creating confusion among it's readers.In 'F? @k Knows',the author(thankfully) hasn't resorted to too many of them which makes the book more appealing to the average reader. 1.Singh’s writing style and the length of the book- the book is written in a light hearted tone which makes it an interesting read.Even the most distressing/traumatic incidents are written with a pinch of humour. is written in a light manner . (Sample this-"Yeah,he's only got four months left.He's in the fourth stage of lung cancer". "Uh...fourth stage?What happened to stages one,two and three?").'F? @k knows' is basically old wine in a newer,super cool bottle.There is pretty much nothing in this book which we haven't heard or read before.But I am pretty sure that this is the most humorous take on some of the hard hitting facts about life! 2.As Singh himself has said in the book,this book is free from the usual cliches' associated with the self-help guides.You won't see small quotes by famous personalities followed by painfully long blocks of prose in this book. 4.The author has intelligently linked each and every message he wants to tell to one of his personal experiences.The episode about ‘Pyar mein Kabhi Kabhi,Phir Milenge' (two mainstream Indian feature films which delt with the theme of AIDS/HIV awareness) is worth mentioning.I’m sure that even the most depressed minds will relish his/her ‘breath’ for atleast a second,after reading this. 1.Repetition of themes-The book definitely deserved a better editor.Some of the ‘thoughts’ get repeated multiple times.Okay,we understand the importance of celebrating our lives.But,why tell the same thing again and again? After a point,it is boring. 2.Singh seems to contradict himself at times. I must also confess that the title and the cover design of this book had also left me a bit confused.As i had mentioned before,I was expecting a desi campus love story, targeted at the Young Urban Indian when I picked up this book and was pleasantly surprised when I was proved wrong. 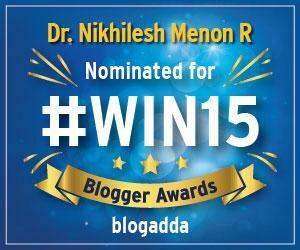 This review is a part of the biggest Book Reviews Program at BlogAdda.com . Participate now to get free books! MBA degree is necessary in today’s business world. So the candidates who are working after doing their bachelor degree they can do MBA.